EUOF, digital painting, 3X4 ft @ 300 dpi, 10/2014. EUOF (“Excessive Use Of Force”) is a complex piece that I’ve come back to, on and off, for over a year, and I think it’s one of my best. At first it may seem like a sci-fi/horror image, and in an apocalyptic future that’s accurate enough, but as the title suggests, it’s also a reflection on the real world we live in now. The first thing I’d want people to know about this image is that it isn’t just a JPEG on your screen. It’s a very large image. By that I don’t mean that I enlarged it on the computer, but rather I worked on it large to begin with, in which case it has a lot of fine details and will print out hi-rez at 4 feet wide (though you could go 8 ft wide at 150 dpi, which is standard high-end printing resolution). Below you can see a small section, including the robot’s finger with a drop of blood on it. Standard sized on-screen JPEG at 800 pixels wide. Notice the detail of the finger. Now you can see below, on the left, what that finger looks like at actual pixels; and on the right you can see what it would look like if we just enlarged the image after the fact. To see the whole image at actual pixels on a monitor (which is 72 pixels per inch) you’d need a 200 inch (16 ft wide) wide monitor. I put a lot of extra work into making my images look good large so that they can be printed out gloriously and hung in a gallery. I think people will be more impressed, particularly in a fine art context, if an image is 8 ft wide, as opposed to 11 inches wide. Yup, even if you are doing very detailed work, and crafting each brush stroke, you have to compete with wall-sized color field paintings done with a paint roller. Other than that, yeah, it’s just cool to have fine detail and a big image. Here are some more close ups so you can appreciate the surface detail more, which is very important to me, and which is lost in small images on screens. These are 75% zoomed in. Click into the gallery to see larger pics. I switch up my approaches a lot from piece to piece, and even within a given piece, and much of what I do is experimentation, trial and error, revision, getting new ideas from mistakes, and so on. The piece evolves rather organically, changing all over. Below is the first sketch I made. 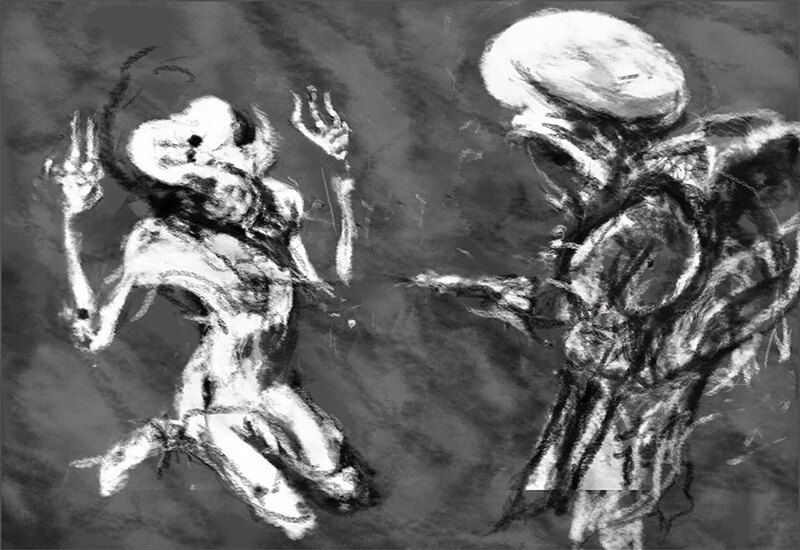 In this case I was after a general feeling, and wanted two figures, one sitting on the ground with hands up surrendering, and the other standing figure shooting. I started off with a small image and just black and white so I could make major adjustments fast. A lot of it is drawing, and a lot is using Photoshop’s native photo editing tools to cut, paste, flip, rotate, distort, and so on to help give me new ideas. I kept refining this until I had a complete B&W image. And here’s a close up of the human victim’s face. A lot of my work doesn’t have a fully realized B&W version, but in this case I wanted to try to nail down the figures and the composition before going into color. For the record, drawing with a stylus and drawing tablet is a lot harder than using a pencil or charcoal in my experience, but it allows for infinite flexibility, which is a trade off I choose to make. Getting through the color phase and paintings phases are elaborate processes I’ve devised and combined over the years, and too complicated to go into here. 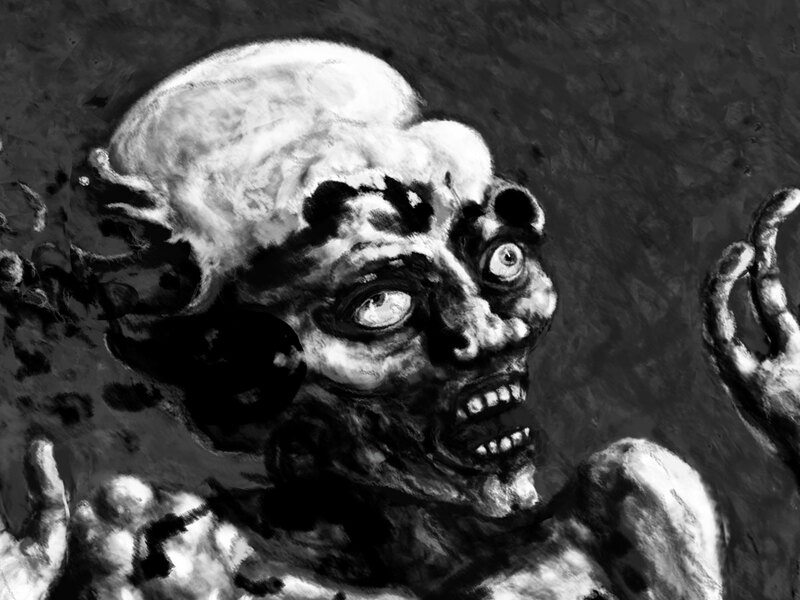 But, below, you can see a GIF animation (low rez) showing the final B&W version, the final color version, and then the painted version. Even though I thought I’d hammered out the figure and composition, you can see a lot of changes between each stage, such as the sort of jet pack that the robot acquires only in the final painted stage. Next is a short movie I made showing 25 different stages of the piece. At this point in my “career” my biggest influence has got to be myself, followed by my two long-time favorite artists, Vincent Van Gogh, and Francis Bacon. I think anyone who is well familiar with those two artist can see aspects of their work in the finished EUOF. And this is going to be a bit odd for people who see the work as primarily sci-fi, and thus illustration or popular art rather than fine art. Of course I have a sensibility that reflects the time I live in, and autonomous armed robots are not a thing of science fiction anymore. Aside from the major influences, some famous paintings have obvious overlap, mostly in terms of the content. Massacre in Korea, 1951, by Picasso. The Third of May, 1808, by Goya. 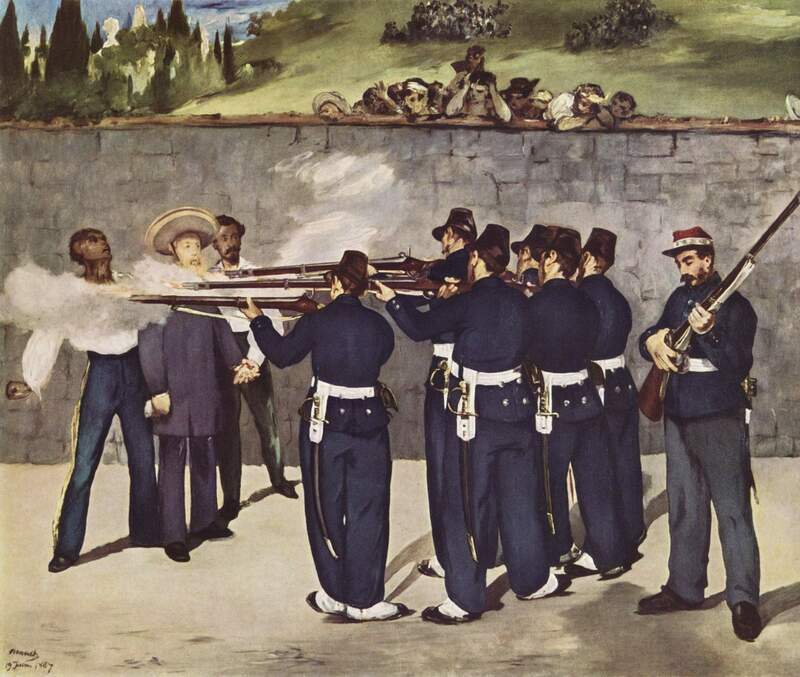 The Execution of Emperor Maximilian, 1869, by Manet. And another image, which made a very big impression on me when I was a kid and I saw it in the record store. 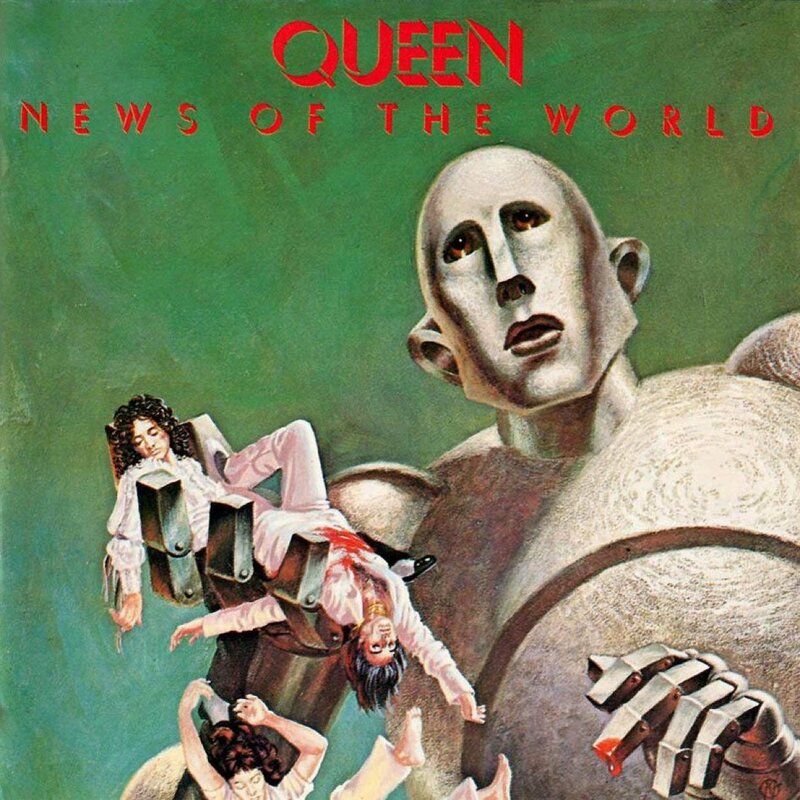 Cover of Queen’s News of the Word, 1977, by Frank Kelly Freas. I used the drop of blood on the finger concept on my robot as well, though mine doesn’t have any misgivings about the horror he’s perpetrated. My original inspiration came from all the executions I was seeing in the news around that time. There were the beheadings by ISIS, misguided drone strikes, revolution in Syria, and of course the shooting of Michael Brown. It’s not a high point for the evolution of consciousness of our species that we still go around executing people on slim cause, having so little understanding or appreciation for the lives of others. As usual I like to build ambivalence and multiple possible readings into my imagery. We don’t know why the robot has shot up the humanoid, and I say humanoid because he appears to be some sort of mutant. I think people would side with the mutant because he looks to be surrendering, and to no avail. I chose to make him a mutant as a sort of visual metaphor for the way people “other” and dehumanize those they perceive as outsiders and different from themselves. It’s rarely a “human being” that is being executed, but some sort of monster or inferior being. Though the same could be said for perceptions of police or soldiers, who are also humans, and usually working class people with their own struggles. However, my sympathy is more for the victims of execution than the perpetrators, even if we must realize that we are or were all capable of such barbarities, and no one is inherently ethical or good. It’s a lifelong struggle between selfishness and generosity, and most of us aren’t really put to the test. 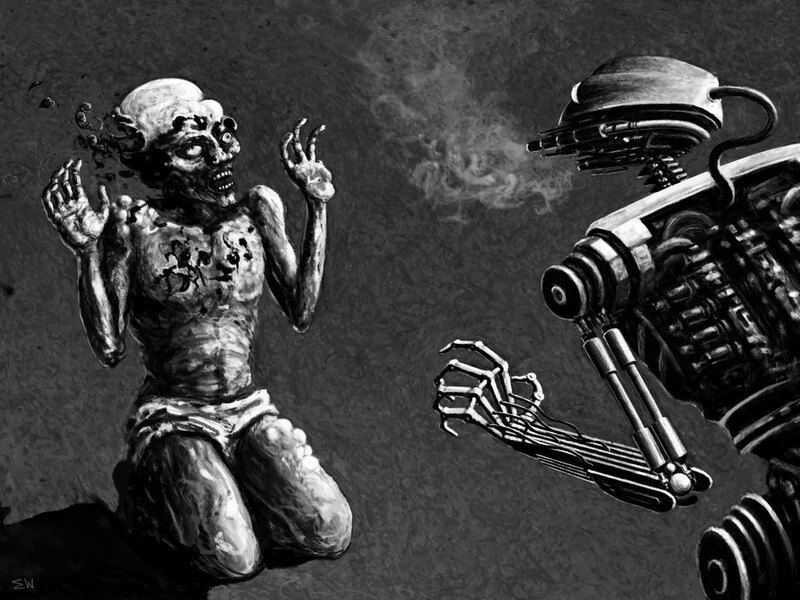 The robot of course has no compassion and is just following its programming. It could be a soldier, sentry, border patrol, revolutionary, extremist, or police… Whichever role it is in, in the circumstance it has the power, and uses it without reservation. This could take place in the future in a robot Vs. humans war in which the robots are systematically annihilating what’s left of a post-apocalyptic, decimated, diseased and dying human species. This also stems from my suspicion that the robots that are being developed by DARPA and others may be used in battle against humans, perhaps even as the troops of the 1% when the thronging mass of people rise up against them. We already have drones, and killing from afar. By me, we don’t need to be developing new and more advanced military weapons, but rather making friends with the rest of humanity and investing in alternative energy and using technology in ways that will benefit everyone. We probably already have enough military might. Besides which, it’s time to evolve, folks. Well, you could read it that a clean robot is ridding the world of some vile, terrorist, cretin, and I deliberately created that effect, but I really intend our sympathies to be with the living, conscious, suffering being. The victim is pleading at all costs, “don’t shoot”, and is riddled with bullets as a perfunctory matter of course: the execution of an equation by a calculator. All the mental might of the victim, his will and every bit of energy he could marshal were helpless against bare circumstance – an unfortunate and irreversible role of the dice. I do really like the robot, though, and as you can see in the stages of development, it’s something I came up with on the fly. He has a retro feel which hearkens back to my childhood when sci-fi was a liberating escape for the imagination from the mundanity of school and the relatively sheltered life of a child. The robot doesn’t exactly make sense mechanically, and that is on purpose. He’s more of a movie robot like I’d see in my childhood than a modern one, or the really overblown ones that are so common now, with enormous, thick bodies, and tiny heads. I also got the idea for mounting guns on its face, which makes a lot of sense because it is already automatically aiming its weapon at whatever its looking at, and it doesn’t have to hold anything in its hands. Lastly, I don’t believe art is primarily a tool of politics, as some of my art professors did in graduate school (in which case art would have no intrinsic value) so don’t want to get too into specific politics.There’s a tendency for those who look at art through a very political lens to like or dislike a piece based strictly on whether they believe it substantiates or attacks whatever side they take on a specific issue. This is why I chose to use a robot and a mutant (though he became much less mutated over time): to pan back to an essential conflict that anyone, anywhere could potentially relate to. And if you like my art, and would like to see me keep working, please consider making a very small donation. Through Patreon, you can give $1 (or more) per significant new work I produce, and cap it at a maximum of $1 a month. Ah, if only I could amass a few hundred dollars per month this way, I could focus entirely on my art. See how it works here. 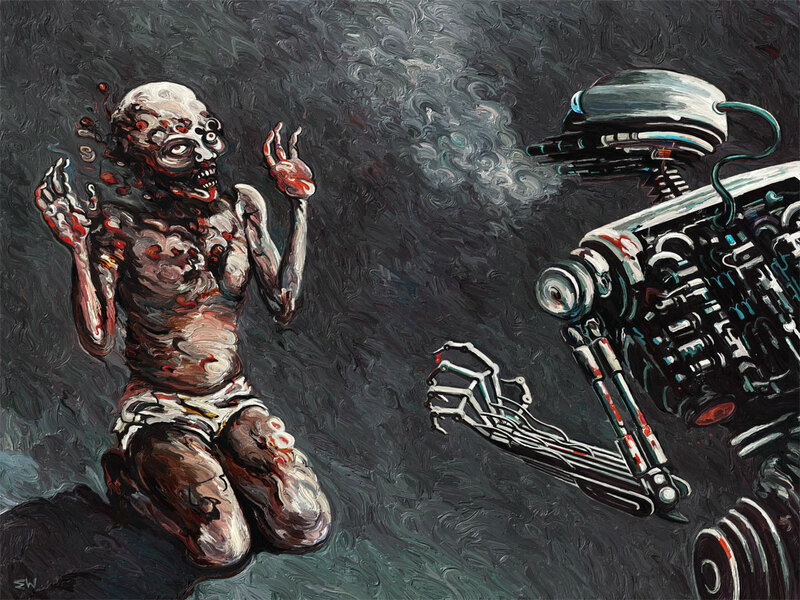 Posted in UncategorizedTagged art, artificial intelligence, contemporary art, execution, Expressionism, horror, robot, sci-fi, SurrealismBookmark the permalink. If not, you may find it of interest. Note that I don’t like violence either, but depict it sometimes in my art as a reaction to, and a reflection on the world we live in. Love the painting. It is very horrifying and intense. Love the mad expression on the human.